Singultus (Hiccups, Hiccoughs) was described by Thomas Lupton in 1627 as 'a repeating characteristic sound occurring with the sudden closure of glottis due to the involuntary, intermittent and spasmodic contraction of diaphragm and intercostal muscles., It was claimed that a neuronal web located in the brain stem was responsible for the hiccups defining this condition as an involuntary medullary reflex. Hiccups center is located between the third and fifth cervical segments of the spinal cord. Somatic and sensory signals formed by afferent fibres of phrenic, vagal and sympathetic are transmitted to the diaphragm and intercostal muscles through the efferent fibres. This stimulation results in the contraction occurring in the diaphragm and intercostal muscles and it is known to cause hiccups. Neurotransmitters dopamine, serotonin and GABA were suggested to play a role in the development hiccups. Hypo-, hyper-dopaminergic situations, changes in serotonin, and GABA system have important roles in the formation of hiccups. It was generally accepted as a symptom rather than a disease. It is a fairly common condition. It was stated that it could even be seen in fetus starting from the eight week of pregnancy. Stimulation or irritation of any component of the hiccup reflex arc may produce hiccups and thus a wide range of diagnoses should be considered. It is unclear whether hiccups have a function, but it is well known that hiccups affect the quality of life rather negatively. A patient with a persistent hiccup reaching remission after radiofrequency application on phrenic nerve and gabapentin treatment is explained in this paper. A 54-year-old man was admitted in our family healthcare centre with hiccups complaint in February 2016. He worked as a mason and a blacksmith. He defined hiccups present for nearly 1.5 years. He also complained of getting burp quite frequently. In this period, he was admitted to emergency service ten times with fainting or almost fainting, cold sweating and hand stretching complaints. The patient also said that he frequently threw up when he had hiccups and his social life was negatively affected. He used to smoke a box of cigarettes daily for 15 years and quit smoking six years ago. He quit drinking alcohol 10 years ago and was a social drinker before quitting. He never used narcotics. He didn't report any disease or constant drug use and any operation or trauma. Family history was insignificant. The patient was admitted to general surgery department when hiccups started 1.5 years ago. The blood sample showed no electrolyte or metabolic disturbance, in the same centre he had undergone chest radiography, esophagogastroduodenoscopy (EGD), abdominal and thorax computed tomography (CT), all of which were normal. Then, the patient was referred to cardiology department for occasional chest pains and an echocardiography and coronary angiography was applied. Multiple mild occlusions in coronary arteries were found, and he was discharged with only antiaggregant treatment. The patient whose complaints persisted also visited internal medicine, gastroenterology and psychiatry departments. In these departments, blood tests, electrocardiogram and abdominal ultrasound were done and EGD was repeated and no definitive reason for the complaint was found. He reported that he was treated with baclofen, esomeprazole and hyoscine-n-butylbromur without relief. He used escitalopram and chlorpromazine for a short time and quit because they negatively affected his sleeping. As he did not have any relief from medications, he started to seek remedy from paramedical treatments (drinking olive oil, cupping, and spiritual methods). In his psychiatric examination it was revealed that his mood was anxious. His consciousness, orientation and attention were intact. No distortion in memory or perception was noted. His systemic vitals and his physical examination were normal. His neurologic examination revealed no findings to explain his dysautonomic symptoms. The chest radiography and ECHO were repeated and found normal. Brain, brainstem, cervical cord, and neck magnetic resonance images were obtained. Minor chronic ischemic parenchymal changes were detected in bilateral periventricular white matter areas and the patient was referred to a neurologist. It was stated that these changes cannot explain the presence of his symptoms. We failed to reveal the cause or the precipitating factors for the hiccups, so we considered that it was idiopathic hiccups. The patient who had used different medications to stop hiccups previously refused any drug therapy. So, in line with literature, the patient was referred to algology and an intervention on phrenic nerve was planned. Before intervention patient was informed about the procedure and possible complications and a written consent was obtained. A venous catheter was replaced and the patient's vitals were monitored. In the supine position his neck was turned into the right side. Under guidance of ultrasound with a 12-L linear probe, phrenic nerve was identified. Cutaneous and subcutaneous anaesthesia was achieved by 1% lidocaine with a 27 gauge needle. Phrenic nerve was approached from about 2 cm over the midpoint of the clavicle, right under sternocleidomastoid muscle with a 22-gauge 5mm active tip radiofrequency needle under ultrasound-guidance. After receiving response from motor stimuli given to left diaphragm muscle (2 Hz, 1 msec and at 0.7 V), 5 cc of 1% lidocaine was slowly administered for diagnostic blockade. A positive response to blockade was noted and patient's hiccups stopped temporarily. Two weeks later, pulsed radiofrequency (8 minutes, 45 Volts, 20 milliseconds wavelength) was applied with the same technique described above. An immediate decline in symptoms was observed. The patient was monitored for two hours and then discharged. One week later, the patient reported a significant decline in symptoms but still had hiccups. The patient was offered oral medical therapy again. With considerable relief from symptoms, the patient accepted oral therapy this time. Gabapentin 300 mg bid was prescribed. The symptoms were completely recovered and the patient reported no hiccups after 30 days of Gabapentin administration. Singultus, or hiccups, is derived from the Latin word “singult”, meaning “the act of attempting to catch one's breathing while sobbing”. There are three kinds of hiccups: benign or common (<= 48 hours), persistent (more than 48 hours) or intractable (incapacitating) hiccups (more than a month). Unilateral contraction of left hemidiaphragm is present in nearly 80% of the cases. Pathological hiccups are generally bilateral. There are many possible types of instigators: organic, psychogenic, idiopathic or iatrogenic. Intractable hiccups are often without clear etiology. The source of hiccups is generally found to be gastrointestinal system pathologies. 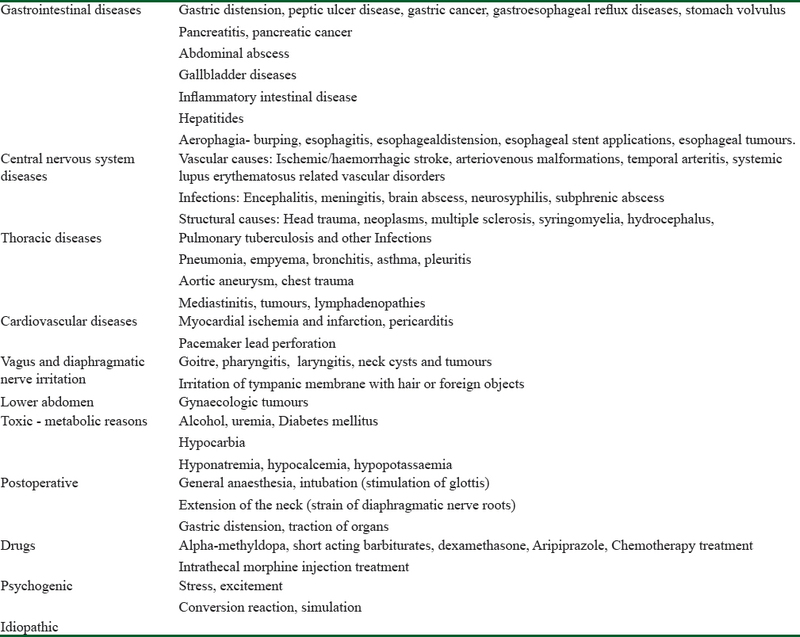 Apart from these, any of the diseases listed in [Table 1] can also cause hiccups.,,,,,, Hiccups affect life quality, career and family life when they become persistent. An American man named Charles Osborne had the hiccups for 68 years, from 1922 to 1990, and he entered in the Guinness World Records as the man with the longest attack of hiccups. In our case, the etiology of hiccups was unknown and patient reported a significant impairment in his quality of life. In the treatment of resistant hiccups, manoeuvres such as oculo-cardiac reflex (Dagnini-Aschner Manoeuvre), carotid sinus massage, Valsalva Manoeuvre, stimulation of the ear/auditory canal, swallowing ice, and induction of emesis were reported. Intravenous lidocaine was also suggested to be a good alternative in persistent hiccups treatment., Continuous Positive Airway Pressure (CPAP) might be an effective treatment for hiccups for selected patients. Conversely, CPAP itself might be a cause of iatrogenic aerophagia leading to gastric distention, singultus and emesis. Steger et al. hypothesized that the gastroesophagealendoscopy stopped the hiccups by triggering either the vagal or phrenic nerve through the oesophageal wall. Anticonvulsants such as carbamazepine, valproic acid, gabapentin, pregabalin, and phenytoin, muscle relaxants such as baclofen and phenytoin, antipsychotics such as clorpromazine and haloperidol and drugs such as midazolam, methylphenidate, metoclopramide, amantadine, nifedipine, nimodipine, amitriptyline, and pramipexole are among the few drugs, which are recommended in single or combined treatment of chronic hiccups.,,,,, Medical treatment in hiccups is usually effective in controlling hiccups but drug treatments tried in our patient were ineffective. In cases resistant to medication, cutting of phrenic nerve or its blockade with a local anaesthetic and pulsed radiofrequency were suggested.,,, Microvascular decompression and vagus nerve stimulation are other surgical techniques used., Acupuncture and hypnosis are among complementary treatment options. The patient who received different oral medications with no relief was anxious and refused any other drug therapy, so we decided an intervention on phrenic nerve. We initially applied blockade on phrenic nerve with lidocaine and then when the complaints of our patient returned after a few days, we applied pulsed radiofrequency in conformity with literature. The symptoms were declined significantly but hiccups continued. Gabapentin therapy discussed in the literature as a treatment option, which the patient had never used was considered. Gabapentin, originally developed as a gammaamino-butyric-acid (GABA) analog, actually works via modulation of the alpha-2-delta subunit of voltage-gated calcium channels, reducing transmitter release., The addition of gabapentin after second intervention stopped hiccups entirely. In conclusion, our case suggests that administration of gabapentin after pulsed radiofrequency might be effective for the treatment of persistent hiccups. Marechal R, Berghmans T, Sculier P. Successful treatment for intractable hiccup with methylphenidate in a lung cancer patient. Support Care Cancer 2003;11:126-8. Full-Young C, Ching-Liang L. Hiccup: Mystery, nature and treatment. J Neurogastroenterol Motil 2012;18:123-30. Bilotta F, Doronzino A, Martini S. Bulbar compression due to vertebrobasilar artery dolichoectasia causing persistent hiccups in a patient successfully treated with diuretics and corticosteroids. J Chinese Clin Med 2008;12:706-08. Ray P, Zia UlHaq M, Nizamie SH. Aripiprazole-induced hiccups: A case report. Gen Hosp Psychiatry 2009;31:382-4. Walker P, Watanabe S, Bruera E. Baclofen, a treatment for chronic hiccup. J Pain Symptom Manage 1998;16:125-32. Payne BR, Tiel RL, Payne MS. Vagus nerve stimulation for chronic intractable hiccups. Case report. J Neurosurg 2005;102:935-7. Mirijello A, Addolorato G, D'Angelo C, Ferrulli A, Vassallo G, Antonelli M, et al. Baclofen in the treatment of persistent hiccup: A case series. Int J Clin Pract 2013; 67:918-21. Becker D. Nausea, vomiting, and hiccups: A review of mechanisms and treatment. Anesth Prog 2010;57:150-56. Hernandez SL, Fasnacht KS, Sheyner I, King JM, Stewart JT. Treatment of refractory hiccups with amantadine. J Pain Palliat Care Pharmacother 2015; 29:374-77. Cabane J, Bizec JL, Derenne JP. A diseased esophagus is frequently the cause of chronic hiccup. A prospective study of 184 cases. Presse Med 2010; 39:e141-e146. Eisenächer A, Spiske J. Persistent Hiccups (Singultus) as the Presenting Symptom of Medullary Cavernoma. Dtsch Arztebl Int 2011;108:822-6. Demirci H, Gülşen M. Hıçkırık (singultus). Güncel Gastroenteroloji 2014;18:277-84. Yildirim A, Turan S. Aripiprazole induced hiccups: A case report. N Sympos J 2014;52:24-6. Berilgen MS, Demir CF, Aydın M, Erdoğan E. Lateral Medullary Infarction and Accompanying Sustained Hiccup: Treatment with Gabapentin. Fırat Tıp Dergisi 2007;12:231-3. Perry S, Stevenson J. An unusual cause of hiccups. J Accid Emerg Med 1996;13:361-62. Chang FY, Lu CL. Hiccup: Mystery, nature and treatment. J Neurogastroenterol Motil 2012;18:123-30. Launois S, Bizec JL, Whitelaw WA, Cabane J, Derenne JP. Hiccup in adults: An overview. Eur Respir J 1993;6:563-75. Survivor of 68-year hiccup spell dies. Omaha world - herald, 05 may 1991, sunrise. 2b. Petroianu GA. Treatment of hiccup by vagal maneuvers. J Hist Neurosci 2015;24:123-36. Cohen SP, Lubin E, Stojanovic M. Intravenous lidocaine in the treatment of hiccup. South Med J 2001;94:1124-5. Boulouffe C, Vanpee D. Severe hıccups and ıntravenous lıdocaıne. Acta Clin Belg 2007; 62-2:123-5. Delrosso L, Hoque RA. case of obstructive sleep apnea, gastroesophageal reflux disease, and chronic hiccups: Will CPAP help? J Clin Sleep Med 2013;9:92-5. Patel N, O'Brienz K. Persistent singultus: Addressing complexity with simplicity. Acg Case Rep J 2015;2:150-1. Steger M, Schneemann M, Fox M. Systemic review: The pathogenesis and pharmacological treatment of hiccups. Aliment Pharmacol Ther 2015;42:1037-50. Lipsky MS. Chronic hiccups. Am Fam Phys 1986;34:173-7. Friedman NL. Hiccups: Atreatment review. Pharmacotherapy 1996;16:986-95. Wilcock A, Twycross R. Midazolam for intractable hiccup. J Pain Symp Manage 1996;12:59-61. Jatzko A, Stegmeier-Petroianu A, Petroianu GA. Alpha-2-deltalig andsforsingultus (hiccup) treatment: Three case reports. J Pain Symptom Manage 2007;33:756-60. Calsina-Berna A, García-Gómez G, González-Barboteo J, Porta-Sales J. Treatment of chronic hiccups incancer patients: A systematic review. J Palliat Med 2012;15:1142-50. Lewis JH. Hiccups: Causes and cures. J Clin Gastroenterol 1985;7:539-52. Renes SH, van Geffen GJ, Rettig HC, Gielen MJ, Scheffer GJ. Ultrasound-guided continuous phrenic nerve block for persistent hiccups. Reg Anesth Pain Med 2010;35:455-7. Inan N, Tertemiz O, Akcali D, Babacan A. Pulsed radiofrequency lesioning of the phrenic nerve in treatment of intractable hiccup. G M J 2015;26:73-74. Farin A, Chakrabarti I, Giannotta SL, Vaynman S, Samudrala S. Microvascular decompression for intractable singultus: Technical case report. Neurosurgery 2008;62:e1180-1.